SEPTEMBER INSPIRATION…enjoy glorious, golden days! September 1st…heavy rain showers began last night and combined with fierce winds sounded tirelessly until the next morning before finally moving on to the north. The entire yard is strewn with debris, fallen tree limbs and two small trees that fell over…I hope I can keep the chipper-shredder going long enough to clean up and turn the mess into mulch! This heavy chip mulch is excellent for a path or covering under trees…but using this size wood chip as mulch will take away much needed nitrogen from plants. For mulching planted areas I always use FINELY shredded hardwood mulch packed about 3” deep. PLEASE, do not cover the crown of plants…leave breathing space…especially trees! I get so livid when driving around town and see landscape gardeners piling up mulch around tree trunks, sometimes almost 2’ high on the trunk…REALLY STOOOOPID! Think about what will happen under the mulch??? Sorry, I do rant on at times! While the ground is still wet I’ll throw out more wildflower seeds in the side yard or meadow as I call it , lots of poppy seeds out front by the mailbox, fescue in bare spots throughout the lawn, er…what wants to be called grass, and moss…some sweet pea seeds under the bottle tree and nigella and larkspur scattered about the roses and daylilies…while the earth is moist, the seeds should settle into the dirt and be ready to sprout early next spring. Most of these seeds prefer the cold weather “scarification” in order to germinate quickly… [I used the term loosely, I know] Hopefully the guineas will concentrate on the cracked corn I feed them and leave my seeds alone. The sweet olive tree by the steps is in bloom once again…the fragrance reminiscent of driving through the orange groves when I lived in southern California. It’s Sunday and late afternoon, I’ve been working all day in the yard puttering and planting…found a spot for a delightful, deliciously scented new pink Daphne near the front steps so that early in the new year when it blooms the citrusy fragrance will sweeten the path to my door; watered the Sasanqua and other camellias and top-dressed with my rich compost; really important to keep a camellia well-watered during the summer as they set buds then for winter/spring blooms. While dividing some iris to replant plant in the back garden I discovered the divinely fragrant white flowers of a re-blooming ‘Immortality’ iris** I had planted in June…forgot all about her as she was hidden by the other perennials and am filled with joy over the bloom and fragrance…I planted it in Carl’s memory. Then I cut some gorgeous red dahlia blossoms to take to Stephanie’s shop [Morning Glory Gallery] tomorrow; deep watered the Meyer lemon trees; aerated and put compost on my tomatoes… and so on. IRIS info: always plant or transplant iris in September…best root development takes place during the autumn and winter seasons; plant shallow in well-drained soil, do not mulch or fertilize on top of iris rhizomes. Ahh…My favorite time of the day…after a relaxing soak in a lavender scented tub I take a glass of wine out to the back porch…the sound of Vivaldi’s FOUR SEASONS…Autumn, drifts through the open windows and into the yard…I watch as a swallowtail floats from bloom to bloom on the butterfly bush keeping time with the concerto. But I am captivated by the antics of the birds, especially the finches, that use our backyard as a feeding zone/playground. There are moments when an air traffic controller is needed as the golden male finches flit about gathering seed from coneflower heads and the hummingbirds dart from the flame acanthus to the nectar feeder on the window outside the dining area, while narrowly avoiding a mid-air collision with a chickadee on a mission carrying niger seed…all while the swallowtails continue to float above them. With an occasional glance, and cocked eyebrow if she had one, at the aerial stunts, Ms. Cardinal sits happily on the swing feeder daintily pecking at sunflower chips while Mr. Cardinal waits impatiently in the tree above busily chirping out directions…and for some reason, the blue jays are ‘dive-bombing’ the stainless steel gazing balls near the potager…it all makes for some wonderful relaxation and a few chuckles before going in to watch the world news. Labor Day and time to enjoy my summertime “labors”…Give your day, everyday, a good start with a powerful drink before anything else…squeeze 1/2 a lemon and mix juice into a glass of warm water. Drinking it helps flush out the liver and acts as a natural revitalizing boost to your body. Walking along the stone pathway, it is almost entirely enveloped in a multi-colored cloud of autumn flowers and herbs…a pyrotechnic blaze of yellow, oranges and reds from floral to foliage…lar drifts of flowering perennials set against a background of purple, pink and white profusion butterfly bushes. I wasn’t just looking at the garden I was part of it for a while as I pulled some stray seedlings and way overgrown stems of summer wildflowers. *I usually plant morning glory and moon vine together where there is plenty of room to grow…their blooms are beautiful…one you see in the morning, the other in the early evening. Thinking about my friends and how thankful I am for their help and friendship, I decided to get into the end-of-summer holiday spirit and make the most of the long, balmy holiday evening and floral fragrance in the garden by inviting a few of them over for an alfresco dinner. I’ll serve my favorite spirits, a crisp French Rose´[ the one with the chickens on the label my friends always say] and a lovely Prosecco, for a treat with the wine, some curried pecans** I made a few days ago…along with a nice crab risotto, some salad greens from the garden, fresh baked whole grain herb bread and homemade vanilla ice cream…with blackberries from Weezie’s garden! Later in September…After a few cool nights, some of the trees are turning color already, leaves drop off, twist and swirl to the ground. A few of the poplar trees are almost bare, their leaves having shriveled up and fallen off…doubtless due to the sporadic drought from past two years. I love this time of year, the colors, the changing light, the crisp morning stillness, the pale autumn sun filtering through the remaining leaves on the trees…all invoke an atmosphere of slipping gently into winter…being here, outside, watching life happen all around me is glorious…Nature’s palette turns from bright to burning as the dappled light points out the rich red and golden ochre of the autumn leaves…there is no more tranquil place to be this morning than our home in the midst of all this fall glory…the warm colors of salvias, zinnias, dahlias and Mexican bush sage and mint marigold are a vivid display to brighten the late summer to early fall garden. With hot hues and flamboyant forms, dahlias and chrysanthemums strike a cheery note and seasonal spectacle in the porch planters. Luckily it’s been cool enough at night that even the Michaelmas daisies** are coming into bloom. **Michaelmas daisies in bloom usually signify the end of the farmer’s year…the corn and apples are gathered, Canada Geese preparing to migrate, pumpkins ripening on the vine…of course, the cool night time temps really have an effect on when they bloom.Throughout England and parts of Europe, the feast of St. Michael & All Angels is celebrated by roasting a Michaelmas goose, which is at its best at this time of year having been fattened on a bounty of summer grazing and the harvest fields. Michaelmas Days usually fall a week or so after the Harvest Moon…which is the full moon of the autumn equinox…long tradition even before the birth of Christ. 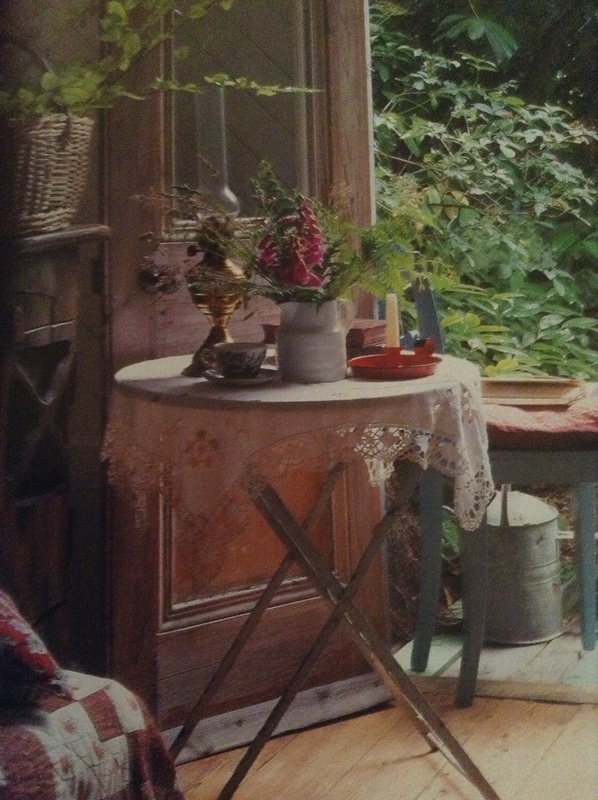 For each side of the French doors I found two rosemary standards to plant in a pair of clay urns. They will look superb and smell sweet with lemon thyme overflowing at the base of each rosemary. A variegated privet with its fresh, creamy white and pale green color will light up a dark corner of the front porch…with an added bonus of fragrant blooms in the spring. What fun reading through them all…I can see myself dancing through the garden next July, arms laden with this jewel of nature. I bury my face into their foliage and breathe in that intoxicating scent. Nothing else smells quite like it…AH, GARLIC! And, don’t forget the health benefits…I just love it! To really appreciate the many personalities of garlic, you have to grow your own. Those sad, half-shriveled heads you find in the grocery store have been bred for long shelf life, not flavor. I plant garlic throughout the garden and especially heavy around my roses [always put a clove in hole when planting a rose]…to deter aphids and help prevent black spot on rose foliage. Garlic will grow in full sun and just about any soil but for spectacular heads they need rich organic soil, well-drained and soft rock phosphate in the whole when planting. I’ll start preparing areas now, working in compost so they will be ready for planting those fat cloves by mid-October. Next year I’ll harvest the garlic in June or July, depending on the variety. Of course I have taken into consideration their eventual size while deciding where to plant any of the above. Hip, Hip Hooray for Rose Hips…The blooms and fragrance of roses are so spectacular…it’s easy to forget that some produce equally as lovely hips. Rose hips add color and interest to the garden in winter and are a great source of vitamin C for us as well as the birds. One more example of Mother Nature providing the nutrients needed to survive the winter season. They can also be used to make tea, jelly and syrup as well as cookies and cakes…as long as they are grown using only organic materials. I use rose hips to make a vitamin rich tea, a bit bland, but honey and lemon help! To use for tea or cooking, I slice off the stem end and split the rose hips open, then scrape out the seeds, rinse in cold water and let them dry. My ‘Autumn Damask’ rose [see photo] is sagging under the weight of all her mini-pumpkin hips, in fact, they’re so big they make mine look small. The ‘Old Blush’ climber on the fence by the garage is also making a splendid display…I forgot to trim the spent blooms…So, I’ll just harvest what I want to use for now and leave the rest for the birds to feast on during the winter. In early spring I’ll prune and let the cycle of growth and bloom start all over again. END OF SEPTEMBER…Growing a fall salad garden…greens thrive in cool weather and the best tasting greens are those that grow quickly with a steady supply of moisture and good, fertile soil rich with compost and worm castings. Organic matter in the soil helps by acting like a sponge, retaining moisture…without it, shallow rooted salad greens would dry out and stop growing. Last month, during a week of showers and cool days, I prepared and reworked the planting area by turning compost into the soil. Then I set out my seeds and plants, watered carefully and mulched the little plant starts with finely shredded leaves and grass clippings. This layer of organic material will help retain moisture and keep the soil warm on cool nights. I always water early in the day at this time of year…foliage that stays wet on cool overnights allows disease organisms to flourish and spread rapidly among plants. Of course, harvesting greens close to time of use provides the best quality of flavor and nutrients. Plants for fall-winter green gardens: I suggest using oriental salad greens such as mizuna, along with a mix of baby mesculun lettuces, Cut & Come Again and Paris Market Mix plus rocket, spinach, chervil, watercress and mache or corn salad. These are such quick growing crops that produce a mass of little leaves and the more I pick, the better! For extra winter protection from wind and cold temps, I use hay bales around the herb and salad greens area and…on those few nights when temps fall close to or below freezing I can just use flannel sheets stretched across the bales to cover the garden. This semi cold frame provides a micro climate for plants…temperature insulation and shelter from frost. SOME GOOD PLANTS FOR FALL TO WINTER COLOR…Glossy Abelia grandiflora foliage shifts from deep green to rosy bronze and purple in late fall. While the white to pinkish summer flowers linger, local and traveling hummingbirds will continue to gather nectar from fragrant bell-shaped blooms. Mine by the driveway has been in full bloom since May. Glossy Abelia typically grows up to about 8 feet high and 6-8 feet wide…but on an organic program, STAND BACK! With its gracefully arching branches, it is an excellent candidate for a hedge or informal screen, wildlife garden, and can also be usedfor covering slopes. Glossy Abelia is usually considered evergreen in our area and will grow in almost any soil in full to part shade. DO NOT SHEAR OR PRUNE THIS PLANT LIKE A BOX OR BALL! It will look AWFUL. Pick-prune only to control growth. Hardy blue plumbago, aka Leadwort, or Ceratostigma plumbaginoides for Latin lovers, is slow to get started in the spring, but this wonderful ground-covering perennial makes a statement late in the growing season. Vivid blue flowers begin to open in late summer and continue well into fall. As petals drop, they leave behind red calyxes, which contrast nicely with the continuing show of blue flowers. With cool weather the olive-green leaves turn to rich bronze red. Plumbago does best grown in a sunny spot with average well-drained soil and moderate moisture. Cut back any woody stems in early spring to stimulate new growth. Typically it will not compete well with shallow tree roots. I like to plant blue plumbago as a border in front of a bed mixed with pink oxalis, garlic chives and fall aster as the back ground. Sedum ‘Autumn Joy’ is an old favorite. Tall fleshy stems hold the promise all summer of those wonderful, rich pink flower heads that last and last. It’s a friendly pink, too, that doesn’t seem to clash with anything. It can be tucked into all sorts of nooks and crannies where its domed heads act like a magnet for late foraging butterflies and bees. Sedum can easily be divided and usually holds its firm rosettes of leaves through a mild winter. What could be more obliging? 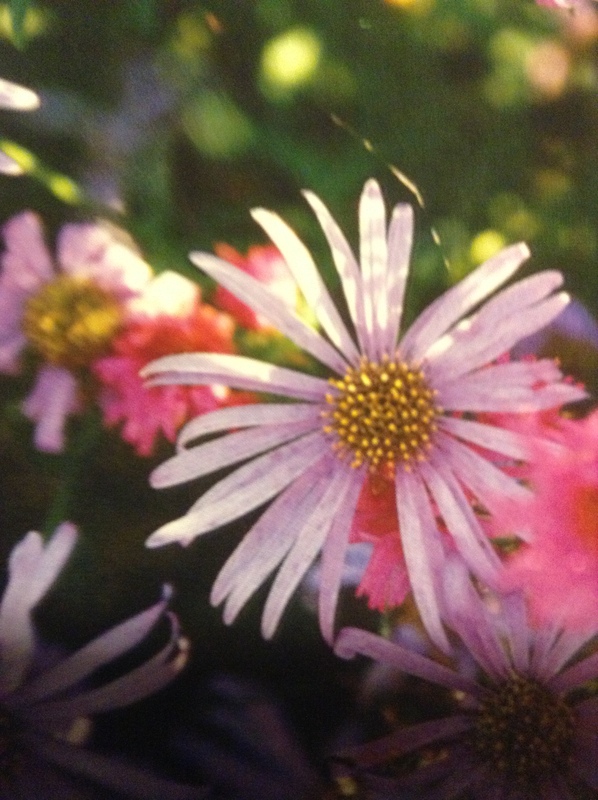 fall asters provide a natural charm which suits more relaxed garden styles. Mostly upright growers, they need the company of slightly lower, more compact perennials such as rudbeckias, yarrows or sedum…but my favorite twosome is asters with Mexican Mint Marigold. Cut asters back in early spring to keep them under control, or, let them grow loose and free as part of a ground cover landscape. Because of their generosity of bloom, asters may grow tired and bare in the center so will need to be divided every 3-4 years. I just take a shovel and lever them out of the ground in spring. Then I hack at the clump and divide the outer, vigorous portions into segments about as big as a southern buttermilk biscuit. I throw away the dead center and replant the good pieces…with roots… being sure to enrich the soil with a little compost…and water well with seaweed. Asters prefer strong morning sun into mid-day and can handle some light afternoon shade. Vigorous growers in our area, asters are quite suitable for naturalizing in native gardens. NOTE: there are several types and colors of fall asters…just consider where you will plant and what blooms will be around them. Patrinias are great but under used plants. The blooms are yarrow-like but more delicate: like a mist of sulfur yellow. They usually flower from late summer into November and make grand cut flowers for the fall tablescape. Even when the flowers fade, their attractive yellow bracts remain showy, and the leaves turn to bronze in autumn. In the garden, I combine Patrinia with Blue Mist caryopteris, boltonia, and another favorite see-through plant, verbena bonariensis…one of my all-time choices for any perennial garden. Last, but actually top of the list for me is Erigeron ‘Profusion’ also referred to as fleabane, ugh…This charming little plant forms neat clumps of basal foliage and blooms like a mass of miniature trailing white daisies that fade to pink. It will bloom sporadically during spring to early summer…go dormant and then come out in a sudden profusion of blooms with cool fall weather and rain. Erigeron does very well in containers but also grows nicely around the ankles of roses. It’s really very difficult to find this lovely little plant. I have some in a pot that I started from seed…so if I see the plant anywhere I go, I buy it and any seed, too. Fall really is the best time to plant…soil is more easily worked when it is warm and moist rather than cold and wet in the spring.The root systems of plants have warmish days and coolish nights to grow quickly and thrive…when spring arrives, plants will be ready to jump ahead with growth! TAKE A BREAK…All this talk about plants and planting reminds me of an easy, lazy way to get rid of grass anywhere that I want to make a new planting area. 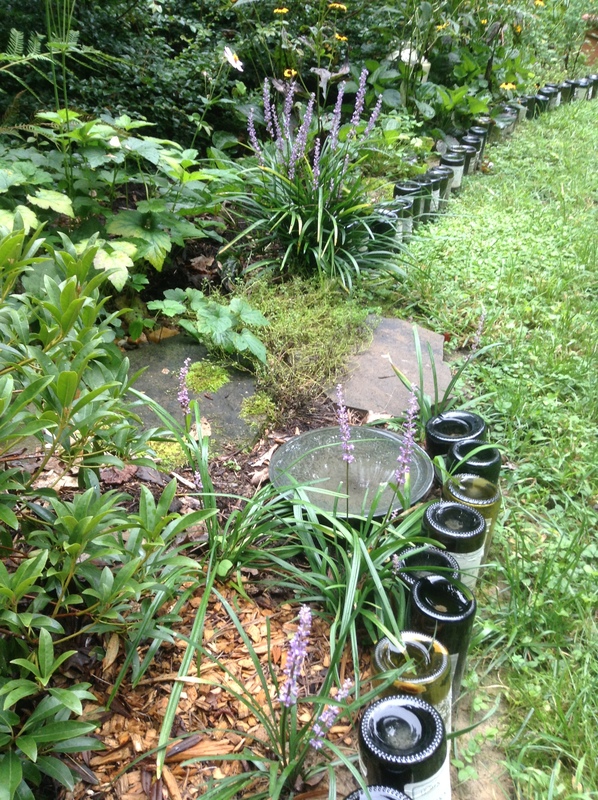 First, I edge or outline the area with a border of some sort…rocks or bricks work fine but I like my favorite recycled wine bottles. Then I cover the grass with an 8-10 sheet layer of newspaper, overlapping sheets as I cover the soil. Sunlight should not be able to reach the grass roots. I cover the paper with a 2-3 inch layer of really good organic material such as compost or shredded leaves or both. This material holds the paper in place and as it breaks down it will improve the soil underneath. Next, water well and then add a finishing layer of shredded hardwood bark mulch. Spray the mulch to wet thoroughly and then set in by patting it with the back of a flat shovel. The key to success now is…DO NOT DISTURB OR WALK ON THIS AREA! By next spring the grass will have died out and the area will be ready for planting through the mulch. Easy peasy! Almost forgot to tell everyone…Garlic chives are in full bloom by now…an easy way to keep them from spreading everywhere…if you really are worried...just cut off the bloom/seed heads when the white bloom fades and seems to be gone…if you let the seeds open to black…watch out! ALL IN THE MIX…For many gardeners, knowing what to choose for a large scale garden and how much to repeat the plants in the borders can be tricky. Experienced gardeners with a good eye for design and balance know the value of repetition, and yet sometimes still struggle to get it right. I am disciplined when creating this type of garden and I use generous groups of only a few plant varieties everywhere throughout the garden as a unifying element…especially those more retiring characters which when used, give a common background to the ‘loud-mouths’. I’m thinking of tall wavy verbena bonariensis, insubstantial in itself but putting a mauve haze throughout a border where it has happily scampered. 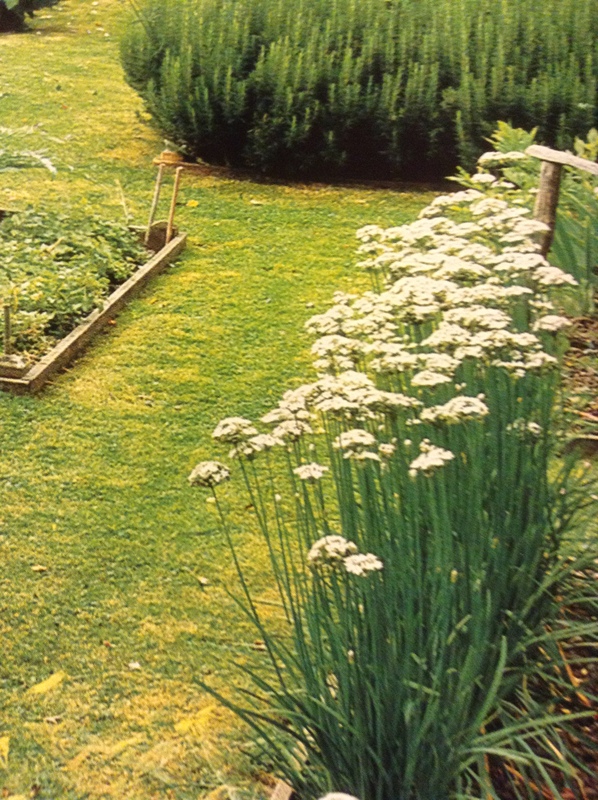 Patrinia is another airy mixer of similar habit, but flowering bright yellow in late summer mixed with old- fashioned wonderfully playful white shasta daisies scattered about that form landing fields for butterflies. AND, I usually include my everywhere plants: fragrant pink and white ‘Stargazer’ oriental lilies planted in groups of 7-10 bulbs throughout the garden, deliciously fragrant tall pink phlox swaying on the breeze behind masses of rudbeckia, and at the edge of the border, a huge mass of Provence lavender…Basically…if you love an effect or combination of plants and it works, by all means…repeat it again and again! Weaving an intricate web…at this time of year when autumn mornings are usually dewy, I notice how many spiders are about. Their delicately spun webs stand out in the morning sunshine, covered in tiny drops of dew, looking like fine jewelry. 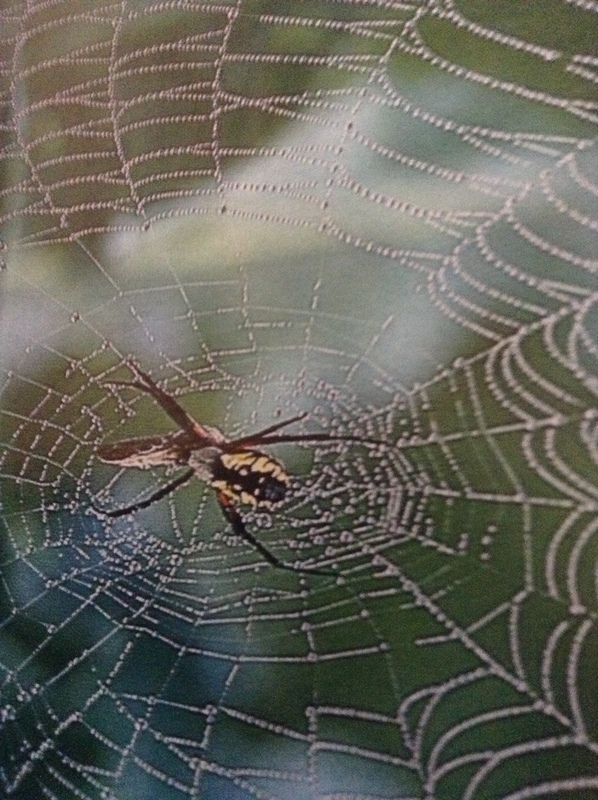 The most common webs are those of the orb-web spiders, all building their characteristic vertical, circular webs. Orb spiderwebs reach their full size and maturity now, spinning their largest webs…which of course are meant to trap prey. Orb silk is sticky in order to hold an insect as soon as it flies in, but these spiders can cleverly run over their webs without sticking themselves because of a special oil produced by their feet. If you see any of these spectacular spiders around your home and garden…please leave them alone, they are quite beneficial.They feed on bugs of all kinds, especially a pest like grasshoppers…I have seen her pounce and “shrink-wrap” one in a few seconds! Where do they spend the winter? BALI would be nice, but they can’t swim that far. If you see large, teardrop shaped brownish bags covered in webbing, well, that’s their winter quarters. For Your Good Health…our book club really appreciates the value of GOOD red wine, especially the “deferring age related effects” and the anti-inflammatory properties help with sore joints after working in the garden…it seems we get younger with each bottle! Of course, you’ll find that red grapes are an even greater source of more concentrated compound, resveratrol, which is the actual active ingredient. But the drinking part is much more fun, especially together! Remember the simple pleasures of life…long, contemplative walks to take with Dougal & Holly, books to read, people and places to visit, plants to grow and seeds to sow, things to bake and make…my garden…my home! Previous Article August…a great month for doing very little!